When the codex came along, it was a novel form for recording knowledge and information—a disruptive technology. One of the most important disruptions in the history of the book was the invention of the book itself, which was originally called the “codex.” Of course, the definition of “book” is broader than the object we are familiar with today, because clay tablets, bamboo, and papyrus scrolls were essentially books, too, just in unfamiliar forms. 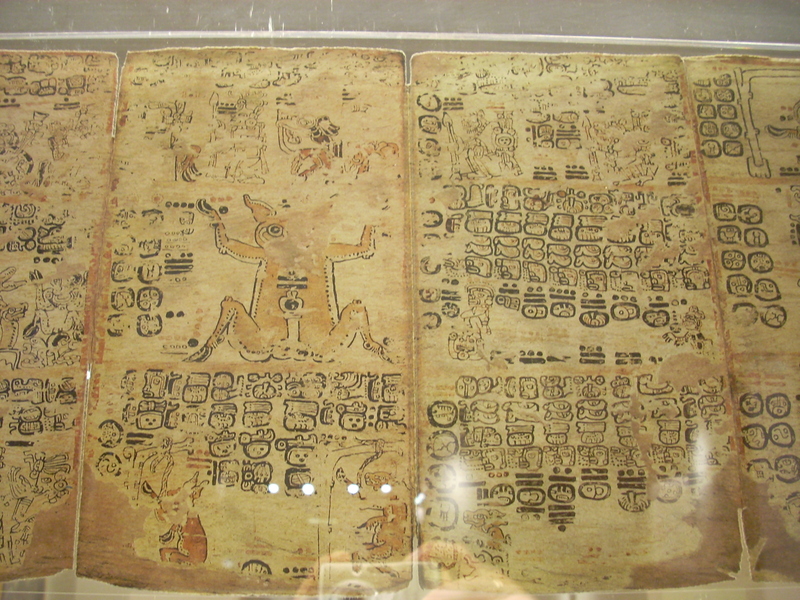 When the codex came along, it was a novel form for recording knowledge and information—a disruptive technology. As we discussed in the introduction, a disruptive technology opens a new market and gradually overtakes an existing one, which is just what happened with the codex in the first centuries A.D. In this chapter, we will see that the book materialized primarily as a way for the early Christians to record their scriptures, and it gradually became the accepted form for preserving texts throughout Europe. Book illustration also changed dramatically because of the opportunities brought by the new technology, and monastic libraries sprang up as centers where books were copied, studied, and preserved during the Middle Ages. The word “codex” is Latin and means “the stem of a tree,” and also refers to a board that was used for keeping accounts. It describes any written work in the form of books, which originally were pages made of papyrus or parchment sewn together at one side and bound in wood or leather covers. [1,2] Before this, texts were usually contained in long scrolls that were rolled up when not being read. Scrolls, although more compact and manageable than bulky clay tablets, were quite cumbersome to handle. In order to reread a passage, a scholar had to rewind the scroll until he found the place he wanted. This would be nearly impossible, since there were no paragraph breaks or capital letters—let alone page numbers—to help guide the reader. Also, a scroll could not contain a lengthy text, so to collect manuscripts one needed a lot of storage space. Usually, scrolls were kept in shelves divided into little compartments, like cubby holes. centuries A.D., which were easier to carry around than unwieldy scrolls. People were very familiar with these notebooks. They used them for jotting things down, keeping accounts, and making first drafts of manuscripts, much like we use spiral-bound notebooks today. generally show a desire to economize space as we might expect. So, why did the codex gain such popularity? It turns out that the development of the codex had less to do with practicality and more to do with the people who began using it: the early Christians. 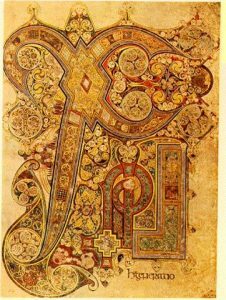 The early Christians were among the first to adopt the codex for their religious texts, and they played a pivotal role in perfecting its technology. We can see from surviving manuscripts that they deliberately chose to record the Gospels and other writings in book form. This may have been partly to differentiate them from first century Jewish texts, which were always recorded From Scroll to Codex: New Technology and New Opportunities – in scrolls. Christianity represents the fulfillment of Judaic tradition, proclaiming the arrival of the Savior and promising eternal life to all who believe in Him. Thus, early Christians would certainly have wanted to set the teachings of Christ and the apostles apart from Judaism. Using the new technology of the codex enabled Christians—and potential converts—to experience both a material and a spiritual transformation in the writings of their faith. Early Christianity also involved a great deal of correspondence. In the first century A.D., Paul and several other apostles, who were the first evangelists, wrote many letters to various churches all around the Mediterranean. It is quite possible that these letters were copied and eventually bound into notebooks. 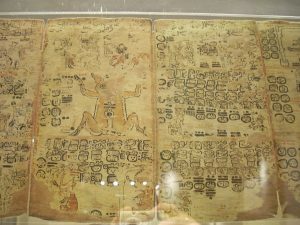 The techniques they used were similar to those used to make codices, and the method easily transferred to more formal writings. Christians had very good reasons for using the codex, and it quickly became the accepted technology for their texts, before Jewish and secular writers fully embraced it. Although a few codices with subjects like astronomy and medicine exist from the first century, the vast majority are Christian texts. Slightly later, Constantius II, who reigned from 337 to 361, appointed a philosopher named Themistius to undertake the rather daunting task of transferring writings from ancient scrolls to modern codices. These texts were not Christian; he unearthed and preserved the works of philosophers and the literature of the ancient poets and playwrights. Clearly, the codex had become accepted as the preferred technology for recording information of all kinds. Eventual acceptance is one of the aspects necessary for technology to be considered disruptive, and the history of the book demonstrates this during the first centuries A.D. Besides giving Christians a way to set their scriptures apart from Judaic texts and providing greater economy of space, the codex offered new opportunities for the illustration of manuscripts. In the scroll, illustrations had taken a subordinate role in the manuscript, usually in the form of simple drawings. [12,13] Now, people began to see the opportunity to enlarge illustrations and separate them from the text. Early books like the Codex Sinaiticus were not extensively illustrated, but soon, art came to define the texts of the Middle Ages. We call this art of book illustration “illumination,” because the designs include opulent gold leaf and bright colors that “light up” the page. Sometimes illumination is confined to borders that surround the text, or embellished letters at the beginning of important passages (previous page), but sometimes a design fills a whole page. Some images are abstract, while others depict scenes from the Bible. In others, dra gons and birds weave among intricate patterns. Most noticeable, however, is the gold and silver leaf that embellishes the brightly painted designs. 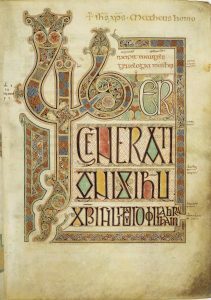 The effect is a dazzling display that complements the manuscript and attests to the artistic talent of the monks, scribes, and illuminators who undertook the work of making these books. Thus, we can see that the disruptive invention of the codex greatly affected illustration as well as manuscript format. large range of pigments, and the book’s cover is decorated with precious stones. Full-page designs of crosses and each of the four gospel writers enhance the text. The artist-scribe wove intricate designs together and used lines of red dots to accentuate curves and letters. But the book’s illuminations were never finished. Some pages only have unfinished sketches, so we must assume that Eadfrith became ill or died before he could complete his great mission. 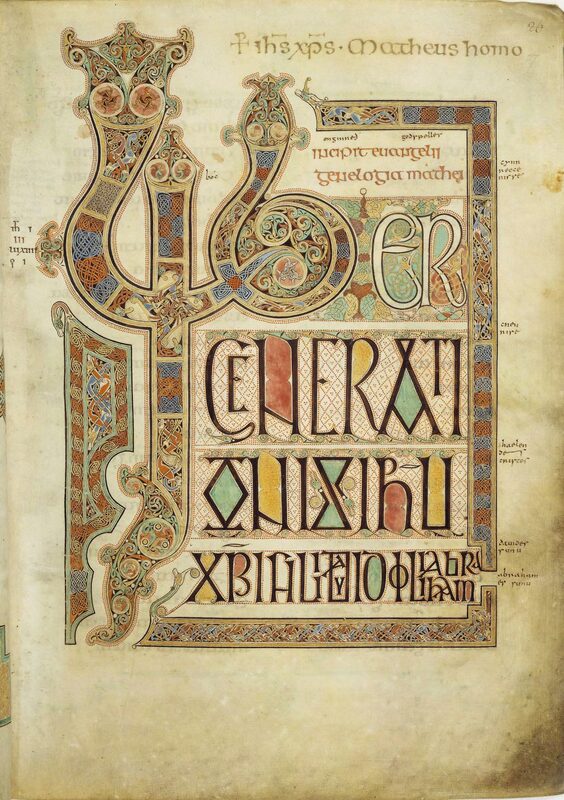 The people responsible for creating the magnificent books of the Middle Ages were, like Eadfrith, usually monks, who were also called scribes. There were secular copyists at the time as well, but most of these scribes were religious men. They lived in remote monasteries, far from the temptations of the world, and spent their time in prayer, work, and study. The Rule of Saint Benedict, written by a famous abbot, encouraged monks to read for three hours each day. Because of this, books—and therefore the creation of more books—were an important part of life. Reading the scriptures and other texts by the church fathers helped the monks learn God’s Word so they could become more righteous and prayerful. copies of the same book. The process in either case was laborious and prone to error, although scribes were warned to be very careful not to alter a word or the meaning of a passage. Even with proofreading, though, mistakes were sometimes overlooked. Copying manuscripts was quite time-intensive, and the complex illuminations certainly added to the labor; a Bible could take one monk fifty years to complete. However, these beautiful books demonstrate how the disruptive technology of the codex provided new opportunities for artistic creativity as well as a novel format for the text. The creation of monastic libraries was another disruptive innovation in the history of the book. Although they were dwarfed in comparison to the great libraries of antiquity like the Ancient Library of Alexandria in Egypt, these libraries became important centers of learning in Medieval Europe. By the fourth century, the public libraries of the classical past were in decline, because early Christians were generally very wary of classical philosophy, and they sometimes even burned pagan books. Ironically, the monastic library came to fill the void of learning left from the neglect and avoidance of classic literature when Christianity first took root. This made books more accessible to scholars and the clergy, and provided opportunities to learn about the scriptures and classic writings of the ancient past. These libraries could be found within monasteries throughout Europe beginning in the 400s, and they contained books on a wide variety of subjects. Of course, the most important and numerous writings were the scriptures—either portions or the entirety of the Bible—but libraries also preserved the writings of the church fathers, rhetoric, medicine, the classics, and even poetry. [18,20] Some clergy still vehemently rejected the pagan writings of the past, but others studied and borrowed from the classics and encouraged their collection. Actually, monks are to be thanked for preserving the classical texts of antiquity, because they may otherwise have been lost. Thus, the Medieval Period, far from being “the Dark Ages,” was a time when knowledge and learning was greatly valued, especially by Christians within the context of monasteries. After the advent of the monastic library, as their collections became larger, monks began cataloging the books. These catalogs were usually just inventories listing the works in the library, and they were not very helpful by modern standards. Although sometimes catalogs were organized by subject or author, many had no organization at all, and provided only the name of the first or most important work in a particular book. We always think of a book as containing one work by one author, but in medieval times, writings—even by different authors—were sometimes put together into one codex. Of course, listing only one work in a volume created incomplete records. Besides this, a library catalog did not give information about where a scholar could find a certain book; it only showed him that the monastery owned it, and then he had to find it himself. However, these catalogs were still an important step in the disruptive innovation of the library. imaginable subject, and books travelled, too. Manuscripts were often copied and taken to other libraries, and pilgrims who visited Rome brought books back to western libraries, which quickly spread both religious and secular writings. The library had become an institution that was an integral part of medieval culture. [3,19] Of course, all this learning took place in a Christian atmosphere; the Church essentially possessed and controlled all knowledge in Europe during the Middle Ages, but libraries allowed access to it, fostered education, and protected the valuable works of the past. Now we can see how disruptive the invention of the codex was, and what an amazing impact it had on the books and the culture of the early Middle Ages. It transformed the way we record information, using a new format and allowing larger and more elaborate decoration of the text. Its popularity first rose among Christians desiring to differentiate their scriptures from Judaic texts and looking for a way to transfer letters to a more permanent and convenient form. The technology, which was completely different from the scroll, didn’t become fully accepted by others until Christians had already begun using it. significant part of our lives today, even though they have continued to change. We still read books in the form of the codex, many volumes are lavishly illustrated, and the library remains a central part of our culture. The invention of the codex was a momentous step in the book’s disruptive history that reminds us of how the present is always shaped by the past. Noah Webster, An American Dictionary of the English Language, facsimile ed. (1828/2000). Herman A. Peterson, “The Genesis of Monastic Libraries:” Libraries & the Cultural Record, 45 (3) 320-332, (2010). Martyn Lyons, Books: A Living History (2011). Alan Jacobs, “Christianity and the Future of the Book:” New Atlantis: A Journal of Technology & Society, 33, 19-36, (2011). Larry W. Hurtado, The Earliest Christian Artifacts: Manuscripts and Christian Origins (2007). Jacob Neusner, “Form and Meaning in Mishnah:” Journal of the American Academy of Religion, 45 (1) 27-54, (1977). Gary Frost, “Adoption of the Codex Book: Parable of a New Reading Mode:” The Book and Paper Group Annual, 17, (1998). Konstantinos Sp. Staikos, The History of the Library in Western Civilization, vol. III [trans. Timothy Cullen and David Hardy] (2007). 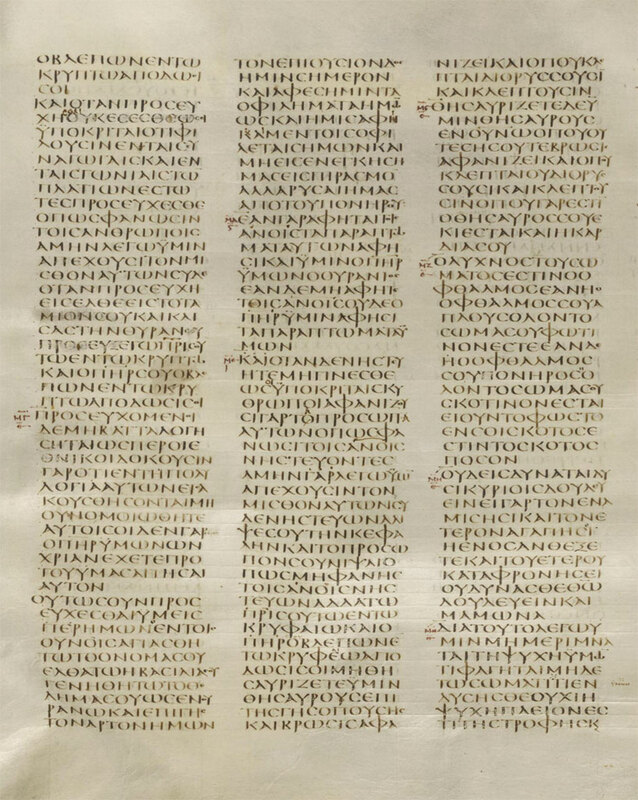 The British Library Board, “Codex Sinaiticus,” Web (n.d.). 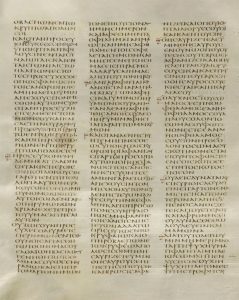 The British Library, Leipzig University Library, St Catherine’s Monastery at Sinai and the National Library of Russia, “History of Codex Sinaiticus,” Web (n.d.). David Diringer, The Illuminated Book (1958). Kurt Weitzmann, Studies in Classical and Byzantine Manuscript Illumination (1971). Timothy Noad and Patricia Seligman, The Illuminated Alphabet (1994). 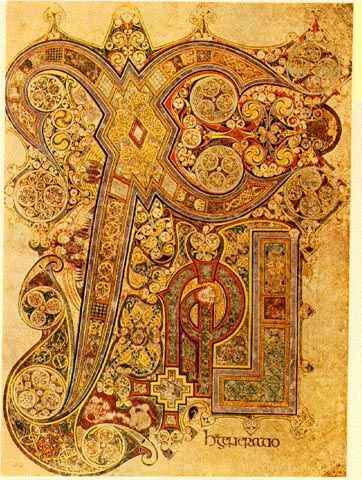 Michelle P. Brown, The Lindisfarne Gospels: Society, Spirituality, and the Scribe (2003). F. Somner Merryweather, Bibliomania in the Middle Ages (1933). Classification of Knowledge:” Journal of Library History, 15 (4) 427-444, (1980). Konstantinos Sp. Staikos, The History of the Library in Western Civilization, vol. IV [trans. Timothy Cullen and David Hardy] (2007). The Cambridge History of English and American Literature, “The Foundation of Libraries: Monastic libraries,” Bartleby.com, Web (2000). From “A History of the Book: From Tablet to Tablet”, originally published by Western Oregon University June 2015, under the terms of a Creative Commons Attribution-NonCommercial 4.0 International license. This entry was posted in Ancient, Art History, Books, History, Medieval, Middle Ages. Bookmark the permalink.